Time to relax! 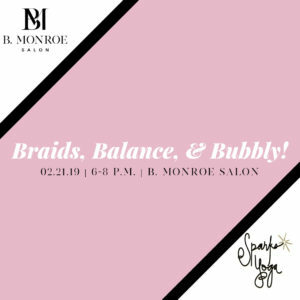 Come unwind after a long work day at our Braids, Balance & Bubbly event. Thursday, February 21, Sparks Yoga will be hosting a yoga class from 7:00-8:00 p.m. at the salon. Come in early for a F R E E braid bar compliments of our B. Monroe Babes. The braid bar will start at 6:00 and last until the yoga begins! But that’s not all! Continue unwinding with a little retail therapy! All participants will receive complimentary champagne and 20% off all boutique items! $15 gets you Braids, Balance, & Bubbly included. Sign up early because space is limited!